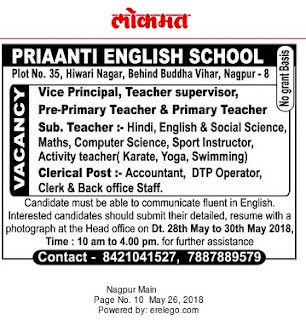 Priaanti English School, Nagpur has advertised in THE Lokmat newspaper for recruitment of Vice Principal, Teachers, Pre-Primary, Primary School jobs vacancies. Interested and eligible job aspirants are requested to attend interview on 28th and 30th May 2018 .Check out further more details below. Name of the School: Priaanti English School, Nagpur. About School:PRIAANTI ENGLISH SCH. TARODI (B) was established in 2004 and it is managed by the Private Unaided Management. It is located in rural area . It is located in KAMPTEE block of NAGPUR district of MAHARASHTRA. The school consists of Grades from 1 to 9. The school is co-educational and it does not have an attached pre-primary section. The school is non-residential in nature and is not using school building as a shift-school. During the previous academic year; the school functioned for 225 days. It had no academic inspection and was not visited by the CRC and BRC Coordinators during the previous academic year. How to Apply: Interested and eligible candidates should submit their detailed resume with a photograph at the head office on dated 28th to 30th May 2018.